Learn about some of GMCI’s success stories below by clicking on the drop down arrows. You can also check out our awards here. The company: J&K Cleaning is a multi-state commercial janitorial services and maintenance contractor. Out of data static website with no search engine presence. No business coming form the web. Their old way of advertising was not working. The Yellow Pages had large monthly bills and the phone was not ringing. New visually appealing template website with easy navigation and well written content for good search engine optimization. Changed them over to a monthly online advertising budget at less than one-fourth the cost of the Yellow Pages advertising. Direct targeting of cities they want to work in to garner the right customers. The company: Algonquin Commons is an outdoor retail lifestyle center in Northern Illinois. Create an event for local mall to create awareness of the 13 restaurants / eateries on premises. Village would not allow a pub crawl, not all eateries offer liquor. Create event that also highlights the 80+ retailers without interrupting shopping. Planned a restaurant scavenger hunt around Halloween time to get local people to try new foods and drinks and learn more about the local eateries. Designed a custom website www.piratesofthecommons.com with ads on social media, radio, newspapers and buses along with venue posters and postcards. Created a custom sign up with online payment options and day-of-sign in through QR codes and code scanners. Coordinated entire project from inception to day of logistics and staffing. All participants received a bag full of coupons, freebies and offers from 80+ retailers in the mall. Event was held outside in parking lots adjoining the restaurants and kept away from retail areas, but also was during retail hours if they wanted to shop after the scavenger hunt. 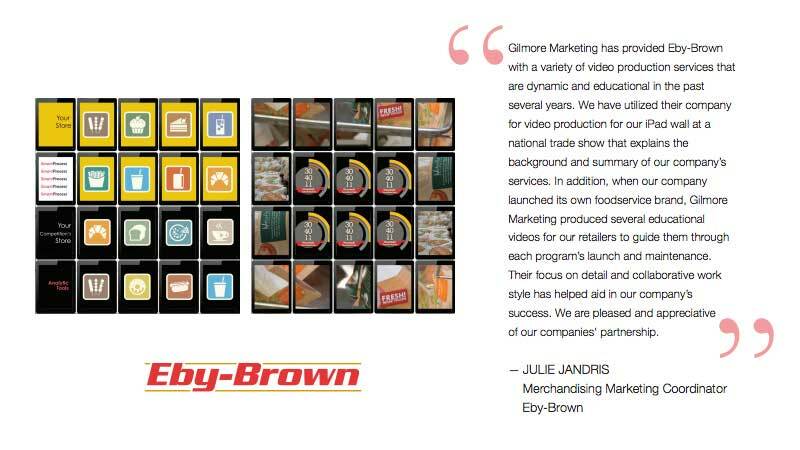 The company: Eby-Brown is a wholesale distributor to the convenience store industry. Needed a video in three weeks for a trade show iPad wall display. Need complete message to explain Eby Brown and the Eby Advantage. Large iPad wall technology and layout. Small budget and quick turn around. No video of product or service available. Traveled out of state for video shoot of supply chain and convenience store. Took B roll and stills locally. Created a template system to design movie to fit the ipad wall. Mixed motion graphics with live action and stills shots to create full effect imagery. Stock and still imagery along with stock music to cut costs. The company: The Write Stuff is a national school-supply kit company that provides brand-name school supplies directly to homes an schools. Lacked internal capability to mange their web page. Needed a differentiation strategy to separate themselves from their competition. wanted to update and integrate their inventory management system & accounting practices. Custom programmed and designed a new website with a user-friendly content management system. 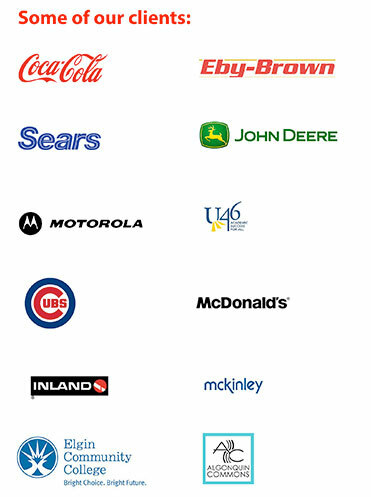 Tailored their new custom packaging lists with proprietary student name stickers and inventory management lists. Programmed a proprietary personalized store application, so client administrators can create their own mini e-store custom branded for their school. Each custom mini store has full administrative capability to keep track of group orders and shipping. Designed a simple interface and custom information graphics to teach potential clients about their services in a friendly easy to read format. Integrated their new site with their current accounting and inventory management systems. Thus, eliminating a bulky third-party program. into regional and national markets. Need complete message to explain why clients should choose Lamp Inc. Worked in depth with Lamp Inc. staff to find a piece of their business that differentiated them from their competiton. Did a detailed competition analysis to compare the company. GMCI created a proprietary list of standards that Lamp Inc. holds their subcontractors and vendors to that are above and beyond any other contractor in the local industry. Wording: Every job uses the Lamp Standard of Excellence,™ a proprietary qualifications program and warranty service. The Lamp Standard requires strict adherence by staff and sub contractors to advanced quality standards and eligibility stipulations. These standards guarantee Lamp’s customers the best quality workmanship and final product in the industry.